I'm in love. It's real and deep. And we will spend so much time together this Summer! ... It's my patio garden -- and it is amazing. If this looks like it was a lot of work, it's because it really really was! Hahaha. But worth every bit of effort because it's like having an extra room of the house, when the weather is nice. I wanted to take pictures that showed what it looks like from the different sides of the patio half walls. I built up using veritical space with various "upcycled" items. More vertical space means more room for containers! Here are some ideas for building that all-important vertical space if you have a patio or porch garden. I have had these modular wire cubes from Target for a while. I brought them out of doors to use on the porch garden at my old apartment in Roslindale, Boston. I kept them for the same purpose for the patio garden at my new apartment in Federal Hill, Providence. Wire cubes are a great way to build vertical space if you're container gardening, because the all-important sunshine can come through at all angles. The only trick with these ones is the height of them. I have to keep the tall-growing plants on the top shelves. I put the smaller growing plants in the inner cubes. Another way to build space is to use plant stands. Rather than use the traditional ones, I got creative. First I used old milk crates, accumlated from who-knows-where. Next I used these color children's chairs from Ocean State Job Lot as plant stands. They were not only less expensive, but they add a bright pop of color and a great little whimsical touch to the container garden. They're super cute! Yep. I totally picked everything along this wall out of other people's trash. I am happy to be an eco-friendly and extremely frugal upcycler. Old wooden chairs make a great addition to a patio garden if you're looking for ways to build more vertical space. The wheeled plastic cart has three plants on the top shelf and the lower shelves work as a kind of mini-garden shed for storing mulch, cleaning supplies and garden tools. The front of the house has a little bit of garden space, as well. I found a ton of clearance plants at Lowes and planted those for the "annual" part of the garden. I planted the Russian sage last year and they're doing well. I'd planted a phlox plant last year but it didn't come back, so I planted dianthus for a perennial this year. Hope it makes it back. It's very pretty. I added tchotchoke from the Dollar Tree and Christmas Tree Shops to fil in space until the plants bloomed. Oh, you know I love my garden tchotchkes. Adding a little fairy garden magic in each pot of the patio container garden means marking the mischief managed with a little or a lot of faerie magic through decorations. Whether it's old sentimental ceramics from my childhood, cute bargain store critters like owls and butterflies, old beautiful stones collected from past gardens and yards I've dug up to plant in, or actual fairy garden decorations, every container has a little something in it beside its plant. You know, to say, "a pagan who loves the earth planted this." My Sage Plant - made it back from last year! which was growing there when we moved in 35 years ago! How CUTE is that fairy garden mushroom house??? I started off gardening season by going to the excellent herbal convention in Somerville, MA, Herbstalk. At that event, I bought a ton of herbs, including ones I hadn't grown before, from my friend Jenny of Muddy River Herbals. Jenny and I worked together at Allandale Farm many years ago. She's a great person and an excellently skilled gardener and garden/ herbal educator. Go to Muddy River Herbals for more from Jenny. I absolutely love fresh herbs. They make cooking and making tea in the growing season so much more bright and delicious. If you've never tried container gardening but always wanted to, I definitely recommend starting off with herbs. It's very rewarding, and a lot of these plants are fairly low maintenance. 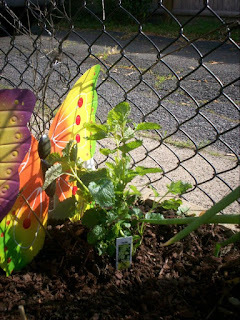 Lemon balm, also called melissa, is a really delicious lemon flavored herb in the mint family. It's great in soups, teas and all kinds of other recipes where a lemon flavor would enhance the taste. Not only is it a delcious herb, it's also really good for you. It helps with skin conditions, antibiotic resistance, anxiety -- all kinds of possible health effects. Even if you doubt these health benefits, since herbal medicinal healing is often looked on with skpeticism, it doesn't hurt to consume it, because it's so yummy. It's also the absolutely easiest herb to grow. These FIVE CONTAINERS started out from one little plant. I planted this little lemon balm plant in my garden in West Roxbury, Boston, seven years ago. I dug it up and planted it in a container and brought it to the Roslindale garden in 2013. Now, in 2018, it takes up FIVE containers. OMG this fairy garden outhouse. Can you even? I mean, you had to know he'd be here, right? The little containers all have single annual plants in them. The plants were in the clearance section of Lowes, 6 for $1. This is my big bargain hunter tip. Always go to the back corner of Lowes and check the clearance section. Most of the plants just need to be deadheaded, but it's easier for them to unload them for cheap than pay to maintain them. Kind of like how slightly dented fruit is totally edible but not perfect so it will leave the grocery store display floor (sadly). And then you just plant them, deadhead (as in pinch off the dead flowers), mulch, and water--and Voila! Thriving little plants for the garden as $.15 a plant! I have three "weeds" that planted themselves in my containers: mullein, purslane and dandelion. Honestly, they're great herbs! So I just let them hand out and stuck some decos in there for fun. Give some consideration to your alleged weeds. They may just be worth keeping around! The best thing about having a patio garden like this is it is making me a morning person...sometimes. I have been doing my best to get up early and make my tea and sip it in the garden to start off the day. It's also a good place on the weekends to sit and read. I showed a friend the patio and he said, "If I had this, I don't think I'd spend time anywhere else!" Even if I don't get to sipping my morning tea out there, I still say hi to all the plants before I leave and check on them when I get home. They know they are loved, which is why I think they're doing so well, so far! Thanks for taking a tour of my patio container garden featuring fairy garden decorations, herbs, annuals and perennials. Hope you enjoyed and maybe got inspired to do your own. It's one of the best hobbies during the growing season!